Set in 17th century England, the film chronicles the rather unpredictable life of Peter Blood (Flynn), an Irish doctor, who performed his duties during the Monmouth rebellion and was convicted of treason when he helped a rebel heal. Rather than being put to death, Blood and the surviving rebels are instead sent by boat to the West Indies where they are sold as slaves to the local Englishmen. Eventually, Blood organizes as a way to get off their little island the only way that makes sense to him – by becoming pirates. Most of the mythos about pirates that we all know and love today can be traced back to the joy Errol Flynn and his crew of brothers in arms feel as they loot, fight, drink and sail on the high seas. They immediately set up a code of honor among fellow pirates, splitting all of their earnings amongst each other and giving extra gold to those who lost a limb for the sake of the crew. But at the same time, they all show such delight when torturing others, especially Colonel Bishop (Lionel Atwill), who had bought most of them as slaves. This is a pirate life built on the highs and lows they all share together. Watching “Captain Blood” shows me why I believe we enjoy pirate movies as much as we do, and it is in much the same vein as gangster movies – we’re enraptured by their lust for more power, more wealth, in an attempt to satisfy their insatiable greed. Then again, what are pirates but gangsters of the sea? Except rather than fighting with guns and wise cracks, they fight with swords and witty remarks. But what makes this film stand out is because of Errol Flynn’s performance, easily able to bounce between dramatic moments of loss and heartbreak and moments of pure joy as he falls in love with the pirate lifestyle, all while feeling like the same caring selfless person he was at the beginning of the movie. Flynn gives this performance his all, always glowing with a radiating energy in his quieter moments with Olivia de Havilland that shows a vulnerable man who wants so much more out of the world. Flynn takes what could have been a simple swash-buckling role and turns it into a flawed man with a large sense of honor that is angry at the world. 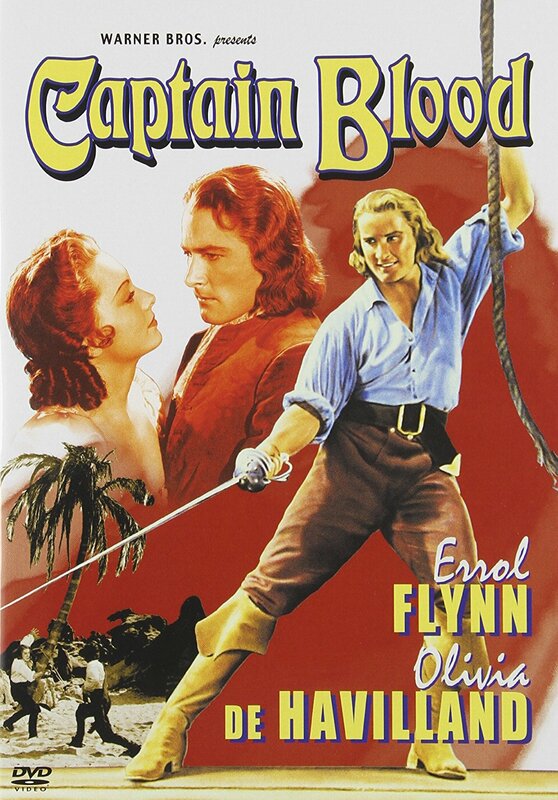 Overall, “Captain Blood” is a great time and one of the best action pieces out of the 1930s. It sets the standard by which all other pirate movies are graded on, and still remains a charming Errol Flynn movie. If you’re curious to see where pirates in Hollywood started from, or want to see the evolution of action stars throughout the decades, then this one is right up your alley.